How’s that holiday shopping list coming along? There’s less than one month left to find the perfect gift for everyone on your shopping list & some of us are feeling the pressure. Shopping for young kids is pretty easy – especially when they circle everything in the toy catalogue – but what about those tweens & teens on your list? One of the hottest tech gifts on the tween & teen list this year is the ALCATEL ONETOUCH IDOL3 5.5″ Smartphone & we’re having a Twitter party to tell you all about it! With the ALCATEL ONETOUCH IDOL3, you get everything you want in a smartphone for less. What puts this high on the wishlist this holiday season? This is just a small sample of what makes this such a great smartphone plus it’s a great price allowing you to stretch that holiday budget even further! 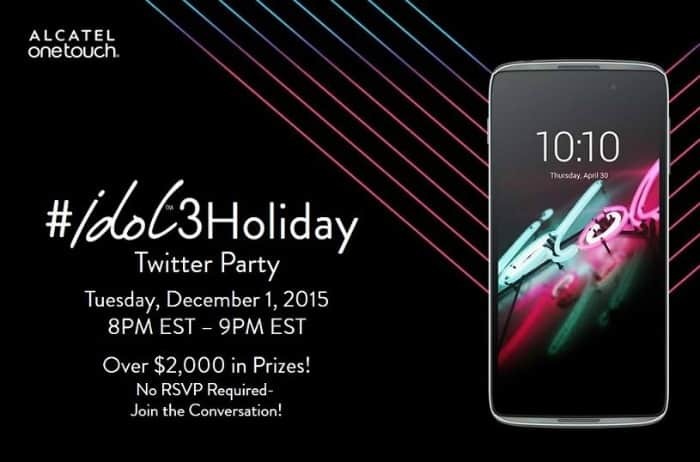 Join us from 8pm to 9pm EST on Tuesday, December 1st for the ALCATEL #IDOL3Holiday Twitter party! We’ll be chatting about the IDOL3 – one of this year’s hottest tech gift ideas for tweens & teens. There will also be some amazing prizes – you could win 1 of 5 prize bundles valued at over $400 each! There is NO RSVP for this Twitter party. Simply join in the conversation by tweeting with the #IDOL3Holiday hashtag between 8pm and 9pm EST on Tuesday, December 1st. We look forward to chatting with you! A wonderful phone. We are wondering, will it work on the TELUS network? Hi! I’m not sure but I’ll find out for you.